In a fancy Manhattan hotel in New York, women in colourful traditional African gowns make their way to one of the conference rooms. Their outfits provide a fascinating contrast to the grey and black business suits surrounding them. The crowd is diverse, but it is gathered because of one thing: Shea butter that comes from an African nut and is used in cosmetics as a lotion or moisturiser. The Shea Butter Trade Industry held its first-ever conference in North America in May 2013. The occasion was an opportunity for African producers to mix with cosmetics industry giants such as L’Oréal and the Body Shop. The demand for shea butter has risen so much in recent years that African producers have started calling for fair prices for their labour. Shea butter comes from the nuts of karité trees that grow in the sahel region, extending from West to East Africa, from Guinea and Senegal to Uganda and South Sudan. For centuries, shea butter has been called “women’s gold” not only for its rich golden colour (although shea butter can also sport a deep ivory hue, depending on the region) but also because it primarily provides employment and income to millions of women across the continent. Using traditional methods, women, often organised in cooperatives, harvest karité fruits. They then crush the nuts inside to extract the precious butter which is boiled, cleaned, packaged and sold at the local markets or exported. Shea butter is non-toxic and edible, and can be used in cooking. But it is mostly used for cosmetic purposes. The UN Development Programme (UNDP) estimates that an average of three million African women work directly or indirectly with shea butter. The top shea nut–producing countries are Nigeria, Mali, Burkina Faso, Ghana, Côte d’Ivoire, Benin and Togo. 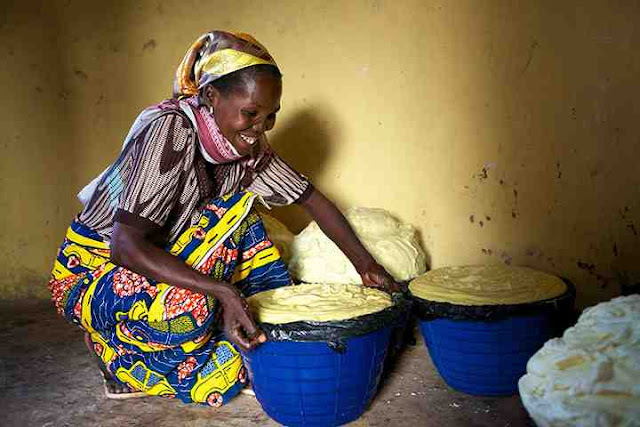 In Ghana, the UNDP, in collaboration with Africa 2000 Network, is empowering rural women in the northern part of the country to boost the local shea butter industry. The project beneficiaries are being trained under the Local Level Integrated Information System (LIIS), a component of the Sustainable Rural Livelihoods Project (SRLP) of the UNDP. “I have been making good money for my family selling shea butter,” Lucette Ndogo, a well-known shea butter vendor at the Marché Central in Douala, Cameroon, said in an interview with Africa Renewal. She purchases the shea butter in bulk from Burkina Faso and sells it for profit to clients who have come to trust the quality of her products. Antoine Turpin of IOI Loders Croklaan, a global producer of edible oils, told The New York Times that “shea [butter] is an important source of revenue to millions of women and their families across Africa. Empowering these women economically is crucial to the industry’s sustainability.” The New York Times says Turpin’s company alone purchases an estimated 25 per cent of all shea nuts picked by women in West Africa. With high demand comes ethical issues which often arise with products originating from the developing world, including Africa. Because of shea’s newfound popularity, the number of shea fair trade cooperatives and associations seeking a fair deal for African women has increased. A UNDP report titled L’Occitane au Burkina Faso: More than Just Business with Shea Butter Producers, highlights the company’s dedication, its collaboration with 15,000 rural women producers and its use of shea butter in its products. According to the report, L’Occitane estimates that it pays 20 to 30 per cent more for shea butter from Burkina Faso than it would for shea butter from Western industries. Sale of shea butter to L’Occitane represent about $1.23 million in revenue yearly for the supplier cooperatives and their 15,000 rural women members. In order for more African women in the shea industry to reap the benefits of fair trade, the Global Shea Alliance, an association that promotes quality and sustainability in the shea butter industry’s support for rural African communities and women’s empowerment, organised the New York Shea Butter Trade Industry Conference. With the first New York fair trade event, the alliance sought to provide a platform for exchanging ideas across the supply chain of collectors, producers, traders, industrial users and consumers of shea butter.